It seems that there is an issue with product microdata display per some product/variant settings. It took some time to find the root of the issue. If the product variant which is set as default has quantity 0 the price microdata is missing for product page. If we set variant as default which has quantity the microdata is showing again. I am attaching some screenshots so i hope you see the issue. 2. Another thing it would be great to have some settings in system->product options where we could select product condition for all products. As example We are selling only new products and having product condtion set to none takes extra click for each product created. Maybe mass action could help here? 1. This point take us some time to understand well the issue. Our conclusion is, you are right from analysis and consistency BUT unless we make a mistake this won't create CEO or MicroData issue. You can try yourself with the link previously provided to check it by yourself. Plus, note that it can't be sometime very difficult to stick to Google Standards, and especially when you have a lot of differents configuration and way to display product page possibilities... The most important is to provide error that will break the MicroData structure and your CEO as well. 2. Not sure to follow you well, here can you details your request with concrete examples ? 3. We will study this question and try to add it for next release, not maybe the next one but as soon as possible ! 1. I know how to test microdata with google tool and that's not the issue. The issue is as in my previous message that If the product variant which is set as default has quantity 0 the price is missing microdata atrributes itemprop="price" and content="Price_value". 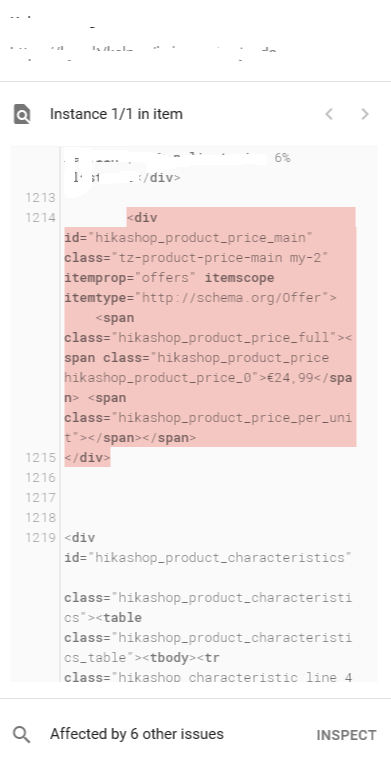 because hikashop selects next variant with quantity and shows its price..... So there is nothing new with google standards its just that Hikashop has some bug with variant price display. Last edit: 2 weeks 2 days ago by kyratn. So that's why Philippe told you to check with the Google tool as with it, you'll see that you don't have that problem of the itemprop missing on the page since it works like the search engine and not like a real browser. And that's what counts for your microdata and your referencing. So while you might have issues with your microdata, it doesn't come from what you described in your first message. Now, if you find issues with your microdata with the Google tool, please provide a link to the page so that we can study the situation. Indeed you are right, my bad... I was so focused on new dev tools that didn't think about that. It seems that the issue is with new google search console as it got updated in March. Hmm, I am now a bit confused. As this could hurt SEO for product or not? And Thanks for explanation Nicolas. Warnings are no problem, but it would be better to fix the error with the price. Could you give a link to that product page so that we could look at the situation ourselves ? Now with google structure data testing tool all is fine but with new google search console it throws price error. Hope you can find some solution for this. I also have notice now that this issue effects itemprop="availability" microdata. So if default variant has quantity "0" then it will show that product is out of stock "<meta itemprop="availability" content=" schema.org/OutOfstock " />" but only variant is out of sotck not product it self. Here is the screenshot from google structure data testing tool of the same product i just gave you a link in above message. We will make some test with your Url link and inform you on our progress, this message to tell you how to solve the "available" issue that we correct for our next release. Last edit: 2 weeks 11 hours ago by Philip. Thank you Philip for looking into this. 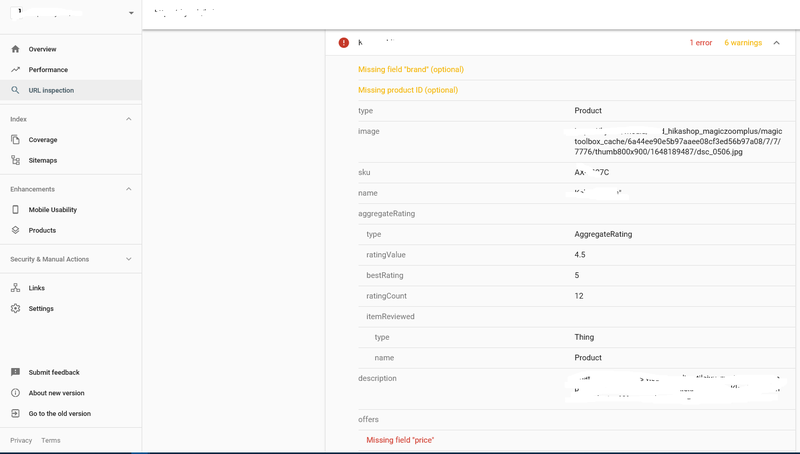 I am not sure if you will be able to test that product url via new google search console( if you have it ) because as for me if i try to inspect url which is not in my property it throws error "URL not in property". For test a page you can use with your browser the right click => View source code, and copy/paste the code in the Google test. It's how I proceed for your page, plus I process some test from my own localhost website with your configuration and get the same results for both page. And so far and for us everything seems correct (putting aside the 4 warning already mentioned). But can you precise where you reach your chrome microdata test ? Does it is an application or a new native Chrome feature ? Last edit: 2 weeks 7 hours ago by Philip. Sorry but you will have to detail more by a step by step because so far i'm not sure to follow you well. First because I was expecting to see a MicroData from the right click in Chrome Browser (maybe a misunderstood...). Anyway details what you done from the search.google.com/search-console/welcome link in order to see the same things as you. Awaiting more elements from you. Last edit: 6 days 12 hours ago by Philip. 1. Create account with google search console ( if not have it ). 4. Create product with 2 variants and set default variant with quantity of 0. Expected results: Same product price error as i have. Thank you for that. Note that Philippe will be back on wednesday and will look at your answer at that point. The google search console seems take to much time to set up, and we can't of course use localhost or demo.hikashop. We will take another way to be sure that we have a real issue can you provide a backend/Frontend access (via our Contact us form, and don't forget to add an Url link to this topic). For the difference between this Google test with the google search console account, we don't know what we can said... Maybe can be something to explore with Google ? Anyway, awaiting elements from you, but note that if we don't see impact on MicroData process or CEO, we will consider this issue like not a real one. Last edit: 6 days 7 hours ago by Philip.